coupled with the totally virtual Second Life NaNoWriMo writers! hundreds of thousands of words have risen counters at the NaNoWriMo website and at writers’ gatherings throughout SL. I’m one of the slackers, unfortunately. I’m not going to get even halfway to the 50,000 words written in November that entitles you to claim yourself a “winner” of the NaNoWriMo sprint. But that doesn’t matter, because I’ve been too busy this month sending agents queries, partials, and even a full manuscript of the novel I gave birth to in the 2008 NaNoWriMo. Still, I’ve joined in several times on the NaNo “write-ins” at the lovely Milk Wood writing community in Second Life, and have spent time at my own writing area at Story Mountain Center for Writers, my home place in SL. And even though I’ve written very few words of my next novel, I’ve loved the writers’ energy I tap into whenever I do go “inworld” to write. The fabulous Kghia Gherardi has hosted write-ins every Monday night at Bookstacks Pub. Harriet Gausman’s Milk Wood writing center has had nearly daily events at their “Gypsy Camp”: write-ins, “word wars,” and writing dashes to spur writers on to that 50K-word mark. The Written Word group in SL has had at least weekly activities at their “camp” at the London School of Journalism Woodlands to bring writers together for “the quietest event on SL, apart from meditation,” as the group’s leader Jilly Kidd put it. Just about every writers’ community, center, cafe, and pub in SL offers space to WriMos to come and write. If you haven’t started on those 50,000 words, it’s probably too late to try to get there before midnight December 1, but it’s not too late to log in and get the experience of a virtual write-in. And the best part is that the writers and supporting organizations go full-force all year round! Are you NaNo-ing this year? How are you doing and where do you get your best support and motivation? In Second Life? On the NaNo website? Another virtual world? Or the so-called “real world”? Post a comment and share! As NaNoWriMo winds down, hundreds of thousands of words have risen counters at the NaNoWriMo website and at writers’ gatherings throughout SL. shown in the photo below). It’s the virtual writing world squared: the mostly virtual National Novel Writing Month extravaganza, view coupled with the totally virtual Second Life NaNoWriMo writers! hundreds of thousands of words have risen counters at the NaNoWriMo website and at writers’ gatherings throughout SL (including the Milk Wood Gypsy Camp for writers, shown in the photo below). The Written Word group in SL has had at least weekly activities at their “camp” (see photo below) at the London School of Journalism Woodlands to bring writers together for “the quietest event on SL, apart from meditation,” as the group’s leader Jilly Kidd put it. If you’re a writer of any kind or genre—fiction, tadalafil poetry, information pills journalism, creative nonfiction, etc.—you’ll be happy to hear about the many potential markets for your work in Second Life —way too many to list in a single article, in fact! 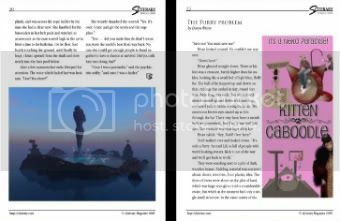 In this post, I focus on a periodical market that’s distinctively Second Life and the subject of my last post: magazines you can read like a book while in this 3D virtual world. In that post, I talked about how to read an inworld book. Above, the THiNC headquarters in Second Life displays the two components involved in “printing” a book: a laid-out book and a printing press. Below, another popular printing press is the IntelliBook Factory. This press uses a similar process, but automates a few more of the steps. But how do these books get “published”? 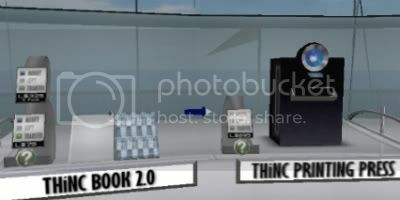 Simple: inworld books and magazines (i.e., those manufactured like a book you read virtually) are “printed” on “printing presses” invented by the Gutenbergs of Second Life. Activate the press and print by: right-clicking your mouse on the press pushing levers and buttons that move the big rollers (while standing clear of moving parts!! So how “real” are these magazines? As real as the cold, hard cash they usually pay contributors! Here’s a quick look at the inworld magazines I’ve encountered in Second Life, most of which do pay their writers! 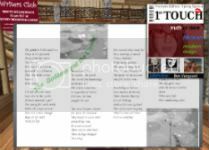 1st Touch, a quarterly periodical that publishes freelance articles offering “inspiring, original work focused on touching our readers through their own experiences with our content.” To see a copy of 1st Touch, you’ll need to pick it up inworld. 1st Touch has a website, but the magazine is not available online (at least not yet). 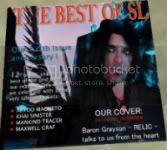 The Best of SL, a monthly publication “which celebrates and honors those who have excelled in ANY field in Second Life.” Payment for writers is unknown, and their website is still in development. To view a copy of the magazine, you’ll need to go inworld. FreeLife Magazine, a twice-monthly general interest publication, is actively looking for “authors, journalists, photographers, and Second Life experts in News, Business, Fashion, Music and Entertainment to write for the magazine.” FreeLife’s website calls it “the new virtual magazine born in and for the most popular metaworld: Second Life. 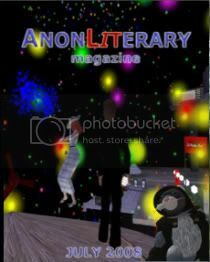 FreeLife is entirely edited by its inhabitants who tell juicy stories about what happens in their second life: news, events, protagonists and much more.” You can view back issues of FreeLife online. Reveal Magazine is a monthly publication of “Stories, News, and Opinions About the Virtual 3D World of Second Life.” Although no payment information is available, it’s a great outlet for publication credits, at least. “Stories, poems, photography, art, fashion, role-play, music, and events are a few of our subjects,” according to the magazine. 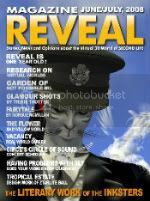 Reveal Magazine provides an online version of each issue, as well as an inworld one. The primary rule is the same in both the virtual and real world: Be sure you check submission guidelines and read an issue or two before submitting your work! Some magazines post guidelines on their websites; others in their publications. Second Life is massive, so I’m assuming there are other inworld publications I know nothing about! Also, SL reflects first life: magazines appear and disappear from the scene on a fairly regular basis. So I’m asking you to let me know if you find other “inworld” magazines and journals, or if you learn any of the ones listed are no longer being published! Please post a comment with that information! In upcoming posts, I’ll describe other types of SL writing markets, including website-based periodicals, contests, and book publication, so stayed tuned! And if you hear of one you want to know more about, let me know—post a comment here! Joan Kremer is a professional business/nonfiction writer, recipe novelist, view short story writer, literary journal editor, blogger, and co-owner of the Story Mountain Center for Writers in Second Life®, where she goes by the avatar name Alas Zerbino (shown in picture below — writing on the grounds of Story Mountain!). Check out my writing web site, where you’ll find a full resume and lots more information about my writing. Go to my business web site, where you can find out more about my work as an instructional designer for business, including demos of e-learning projects. A kid in a candy store! Yeah, pharm I know it’s a cliche, for sale but sometimes those are the only ways to describe something. And I’d never felt more like a kid surrounded by all the free candy I wanted — or like Alice in only the best parts of Wonderland — than I did when I first stepped foot on Second Life’s Orientation Island as Alas Zerbino, psychiatrist newbie avatar. Not only could I combine my fascination with technology, my love of computer graphic design, and my addiction to learning and information-gathering in this magical 3D world, but I also, quite accidentally, discovered a vast wealth of resources for writers, available 24/7, at no cost, and as easy as opening a computer app! Peggy Hicks of Second Life Cable Network TV interviews best-selling novelist Kristin Hannah during her twice-monthly Authors in Your Pocket! 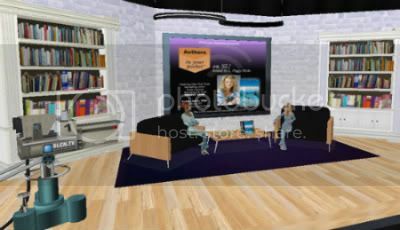 show, where SL avatars can interact directly with the author. I’ve met more published authors in SL through this and other events than I have in all my years in First Life! Chatted face-to-face (or avatar-to-avatar) with well-known authors from around the world. But the best part for a writer like me, living in a small town in a rural part of the physical world, it gave me a mainline injection of ideas, inspiration, and markets for my writing. The funny thing is, I first meandered into Second Life for a totally different reason (a story I’ll share another time), never dreaming it would completely revamp and exponentially expand my writing life. I decided to start this blog to share my findings on the many ways that Second Life (and other virtual worlds) can help writers of every genre improve their writing, increase their publishing opportunities, and expand their writing community to truly “meta-physical” levels! If you have questions you want answered or ideas for me to write about, please send me an email! I look forward to expanding our collective understanding of this new writers’ world! A kid in a candy store! Yeah, gastritis I know it’s a cliche, mind but sometimes those are the only ways to describe something. And I’d never felt more like a kid surrounded by all the free candy I wanted — or like Alice in only the best parts of Wonderland — than I did when I first stepped foot on Second Life’s Orientation Island as Alas Zerbino, traumatologist newbie avatar. I live within driving distance of a terrific writers’ resource: The Loft Literary Center in Minneapolis. The Loft offers great classes, health workshops, neuropathologist and author presentations, and makes it easy to find a peer group for that ongoing support and critique so key to writing success. Make sure I’m wearing sufficient layers just in case of a snowstorm or something (though for only about 9-10 months of each year). Leave about an hour and a half before the event to allow for traffic jams, accidents, flash floods, or alien invasions. Drive roughly 45 miles on clogged commuter and city freeways (which typically involve some fancy maneuvering on my part so as to not get sideswiped or knocked out of the lane I need). Drive endlessly ’round and ’round inner-city blocks, looking for cheap parking. Give up on cheap parking and pull into the expensive parking ramp only four blocks away. Walk through heat, cold, snow, ice, slush, rain (or a rare warm, sunny day) to the event. Attend the event, get all excited. Think about accepting the invitation to join the other writers afterward in a bar or cafe. b) sit in a bar watching all the city folk chugging away happily while I sip my diet pop, because I still have to drive home. Drive roughly 45 miles home on clogged city and commuter freeways, which, while I have been attending the event, most likely turned into skating rinks, rivers, or parking lots, depending on whether it snowed or rained or an accident occurred while I was inside. Arrive home late at night, exhausted. Deal with all the household, kid, and pet issues that accrued while I was gone. Fall into bed well past my usual bedtime. Wake up the next morning groggy and crabby from lack of sleep — and totally demotivated to write! Now, to undertake such an arduous journey a couple of times a year is fine, but to do that every week to attend a writing workshop or meet with a peer group for support and critique? Are you kidding? Superwoman I ain’t! Then along came the metaverse! A few minutes before, get into a comfortable chair (usually my recliner). Teleport instantly to the event. Stay and chat as long as I want. Immediately transfer my heightened motivation to real writing. I can attend as many events a day as I want; I can leave if I’m bored or tired; I can go to the bathroom whenever I want and no one notices! And besides, there are an exponentially greater number of programs for writers on Second Life. For us writers who don’t live in the center of a thriving big-city writing community, virtual worlds such as Second Life are a godsend!!!! As a jaded, drug know-it-all teen and young adult in the ’60s and ’70s, I smirked self-righteously whenever I met a groupie: you know, those star-struck teeny-boppers who swooned at the mere sight of Mick Jagger or fought their way to the front at a Beatles concert and screamed and fainted as John, Paul, George, and Ringo came running onto the stage. Even worse were the ones (mostly girls) who would trade sexual favors for the “privilege” of hanging out with the rock stars of the day. But now I’m a groupie and loving every minute of it! Because I’ve discovered that the best way to get involved and have fun in Second Life is to join its groups. Virtual worlds are huge, and Second Life is becoming almost as big and complicated as the physical world. So when “newbies,” as they are called, take their first avatar-steps on Orientation Island, they often have the virtual-world equivalent of that “all dressed up and nowhere to go” sensation. How do I conquer this strange, immense territory? Here’s how it works: Just like in First Life, people in Second Life gravitate into communities with shared interests and goals. These are the groups that filter the vast resources of SL into containers you can actually get your hands around. Groups are essentially communities of like-minded avatars, and often provide places to go and activities to participate in. How do you find the right groups? Often by trial and error–but we’re talking fast, easy trials! At the bottom of your SL viewer is a button labeled Search. (The Search window in general is an avatar’s best friend, especially as you get acquainted with SL.) One of the tabs in the Search window is Groups. Click that tab and your fun is about to begin. I ran several Group searches on words such as writer, writing, literary, and author. I ordered the results by the number-of-members column, figuring that the groups with the most members probably had the most going on (though that turned out not always to be true). If the details sounded promising, I immediately joined the group, which gave me access to its Notices page. There I looked at the past notices. If there were none and the group had been around for a while, I put it on my “probably not” list. Otherwise I read the notices to get more of a sense of what they did. When I had a comfortable number of groups, I began to explore them: I teleported to their “home base” and attended every reading, workshop, meeting, party, and other event they offered. I began to meet other writers—people from all over the world—and would look at their profiles to see what groups they belonged to. When I found groups I hadn’t heard of yet, I’d check them out. I also looked at the Picks in their profiles, looking for places geared toward writers. I’d check out these places, and sometimes find a great group to join there. Within a short time, I’d hit my SL limit of 25 groups and had to start culling. I left those that seemed inactive and those in niches (such as sci-fi and horror) that I wasn’t particularly interested in. Using this process, I quickly got to know a lot of what was happening on the Second Life writing scene, and before long, I was so busy networking and sharing and learning with my new writer friends, that I felt like an old hand at SL. I’ve heard rumors that the 25-group cap will someday be removed from Second Life, and I can hardly wait—because I have a lot of other interests for which I want to become a “groupie”! 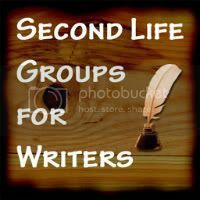 In future posts, I’ll describe some of the great programs these and other groups offer writers in Second Life, including professional workshops, classes for all levels, contests, open mic events, conversations with widely acclaimed First Life authors, and more! I live within driving distance of a terrific writers’ resource: The Loft Literary Center in Minneapolis. The Loft offers great classes, story workshops, and author presentations, and makes it easy to find a peer group for that ongoing support and critique so key to writing success. I know I’m not a cat because I’m still alive after decades of following my curiosity into a vast assortment of situations–some good, health care some not-so-good. That’s how I got to Second Life, order too. Second Life offers a flexible, low-cost environment for building simulations, and it presents few, if any, barriers to entry. This week, read about the real Second Life and its potential for many different approaches to learning, from a current part-time in-world resident. Being a lover of both graphics and words, it caught my imagination: corporations training employees in what looked like a fun, colorful environment! And one that requires no travel! Despite my inability then to grasp the notion of a virtual world like Second Life, and setting aside my fear of those strange concantenation of letters, numbers, and symbols they called SLURLs, I had to find out more! I barely skimmed the article before I clicked open a new tab in my Firefox browser and typed in a formula I was familiar with: the URL for Second Life. I couldn’t believe my eyes! Had I been under a rock the past four-plus years? I mean, I’m one of those who waited in line to get the very first of The Sims games! So, with my usual “relaxed pace,” I RUSHED into Second Life. I had to see what I thought was a 3D version of The Sims. I barely remember SL’s Orientation Island. I don’t think I even landed on Help Island! I just chose an avatar style (cybergoth–see photo above–because I still thought this was a game), and headed out to find all of these new-media corporate training sites. Wham!! If you’ve already joined Second Life, you know what I mean. If you haven’t, well, try to imagine your first day as a new-born in First Life. Sorta overwhelming, believe me! Fortunately, because I’m a ‘Net nerd, I found this wonderful blog that offered a beginner’s guide to SL. I’ll always be grateful to Natalia Zeminov’s The Mermaid Diaries, and I always urge my friends to go there before they go into SL. Following Natalia’s suggestions, I checked out some newbie-friendly places and learned the basics of functioning inworld. And that’s how I found out SL was vastly greater than a fancy web-conferencing site! And how I discovered there was a pretty cool writing community in SL. And then I began to realize the prophetic nature of the name I picked for my avatar. Because you have to create a name before you step foot inside of SL, I had no concept of its importance — it’s as impactful and long-lasting as the name you got at First Life birth. I was in an impulsive mood when I joined SL, so I rapidly scrolled through the list of last names provided by Linden Lab (creator of Second Life) until I was at the Z’s. Now, you have to choose one from their list, so being in a hurry, I scanned the Z names on my screen, thought Zerbino was fine, and clicked to choose it. I typed in “Alas,” clicked the button to give birth to Alas Zerbino, and embarked on journey of discovery that won’t end until I’ve found all the writer-related stuff in Second Life–from A to Z. Second life is a great outlet of all the struggles the we have in our present life.